cellojoe - the wildest beatboxing cellist in the west: Cello Madness Congress is tomorrow! Cello Madness Congress is tomorrow! When was the last time you saw a two high of cellists?? Probably just now in that picture, but probably never before! 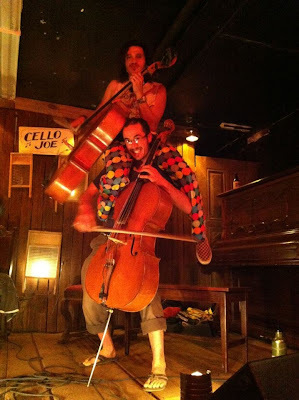 Cello Madness Congress is the wildest cello event in the universe. We get a bunch of cellists together and improvise in front of you, the live audience. It is epic. Just epic. That's all I can say. It's at a secret location in SF. So you have to TEXT me at 65O-2O8-7149 to know where to go.